About | Let's Cake Decorate! Classes are held at various community centers throughout Central MA, USA, and In-Your-Home Class/Parties. My name is Susan, and I'm thrilled to share with you my love of this beautiful sugar art! If you are interested in taking classes, then you may want to know a little bit about the instructor. I've been cake decorating for 25+ years since I first enrolled in the Wilton Method of Cake Decorating Courses as a teenager. At that time, they were offered as correspondence courses that were sent in the mail. I can still feel the excitement I had when that big box of decorating tools and instructions arrived at the doorstep! I couldn't wait to dig in and practice! Well, practice I did, over and over I would make those detailed roses and rosebuds. I practiced and learned enough to made my own wedding cake (what Cake Boss would now call old-school) with pillars, a fountain, staircases and all! Although I still enjoy making occasional specialty cakes for friends and family, I realized the enjoyment of showing others how to decorate their own beautiful sweet creations. So eventually, after many more skills and technique classes and training at the Wilton School (and raising four wonderful boys with many, many birthday cakes) I started my own business "Let's Cake Decorate" teaching classes throughout Central Massachusetts at various local venues, community centers, and private In-Your-Home Class/Parties. Classes can be customized to specific needs. Anywhere from entertainment fun to educational career skills. I've held fun entertainment "ladies night out" parties as well as more educational career specific technique skills to students and local bakery employees. My favorite part of teaching is hearing a student look at their sweet creation at the end of class and say, "I'm so proud of myself right now- I made this!" 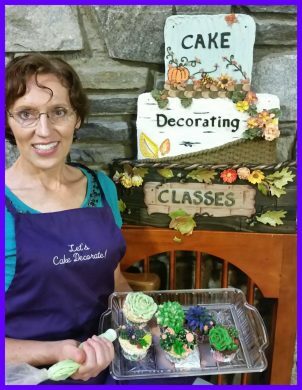 In-Home Class/Parties are a unique event where you and your guests will learn basic cake decorating skills that can be used well after the event is over, in addition to having a lot of fun while learning these skills in the privacy of your home! All the supplies are provided and brought to your class/party for each person to frost and decorate a cake or cupcakes, and a cake box is provided for each guest to carry their cake (or cupcakes) home. Plus, there are two hours of professional instruction time teaching icing & decorating techniques. Each Community Center collects sign-ups /payments differently. To see scheduled classes and more info. click here. Bay Path High School Adult Ed.